To create a special memory and celebrate your anniversary we carry 40th Anniversary wedding accessories, favors and invitations! Our Glass Card Box for your 40th anniversary celebration makes a perfect gift for your guests to put a card in! We carry unique gift items for that special anniversary couple to remember their 40th anniversary! 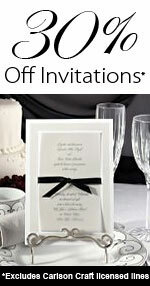 We also carry elegant anniversary invitations!